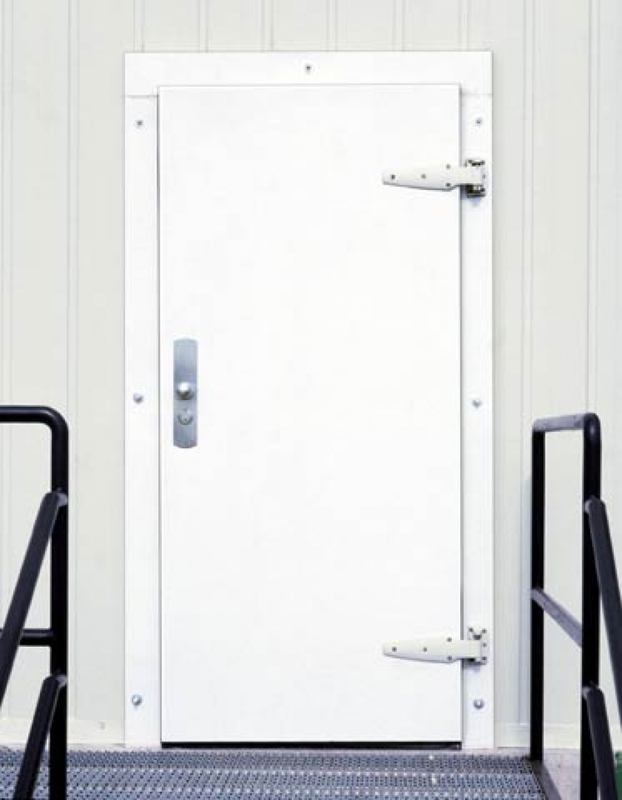 Infitting White Stucco Metal Cooler/Freezer Door – Single | Dock Door Systems Inc. Ideal for heavy hand truck and personnel traffic, the Enviro infitting hinged cooler or freezer door in white stucco metal, meets U.S.D.A. approval. 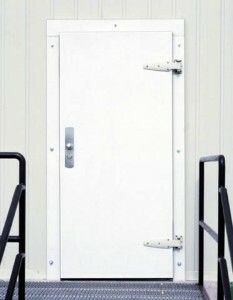 A durable door for heavy personnel traffic, hand truck passage and low temperature operation. Synthetic grease resistant gaskets at four sides for positive seal. Internal 1/4” steel mounting plates for all hardware anchoring. Heavy-duty cam lift hinges, lockable latch, strike and inside release. Freezer door provided with “No Frost” heater cable system. Fully adjustable thermostatic control. Structural frame of wood fully supporting the panel’s perimeter. Panel to be clad with a minimum of 20 gauge galvanized steel, stainless steel, or 24 gauge steel with white stucco-embossed finish. Panel core filled with pour–type polyurethane insulation. 4” (6” for freezers) poured polyurethane foam. Extension of jamb up to 10” std. Galvanized or stainless steel kickplates (16 or 20 gauge) for back and front of door panels, frame and/or jamb extensions and trim. Flat kickplates only on door panel, wraparound available on frame. Heat mat to prevent condensation on thresholds. Windows: 12”x12”, 2 or 3 lite, heated or unheated. 1 year against defects in material or workmanship.